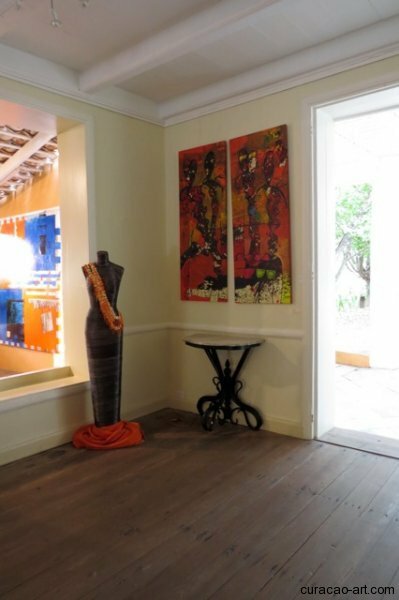 Saturday May 18, 2013 the new art exhibition at Landhuis Bloemhof in Curaçao was opened by acting Governor Adèle van der Pluijm-Vrede. 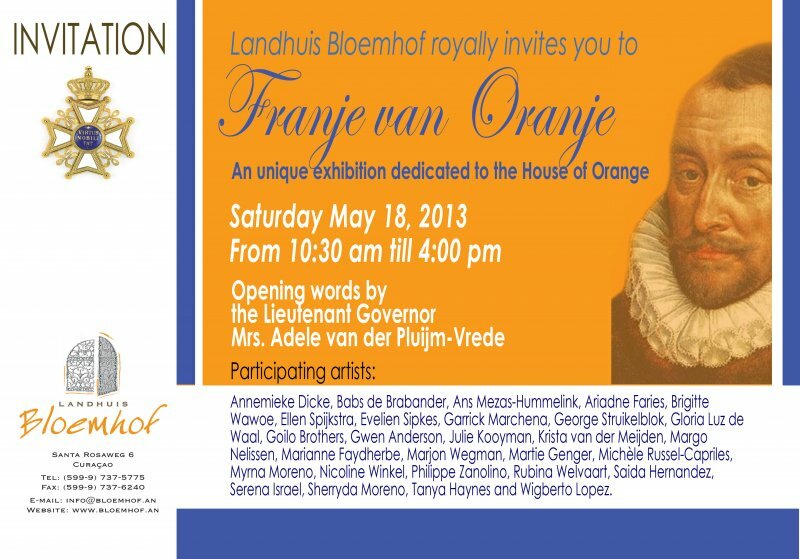 Franje van Oranje or Orange Fringes, is a special group exhibition in honor of the Dutch monarchy. On April 30th 2013, Queen Beatrix of The Netherlands abdicated the throne and her son Willem-Alexander and his wife Máxima became the new king and queen. 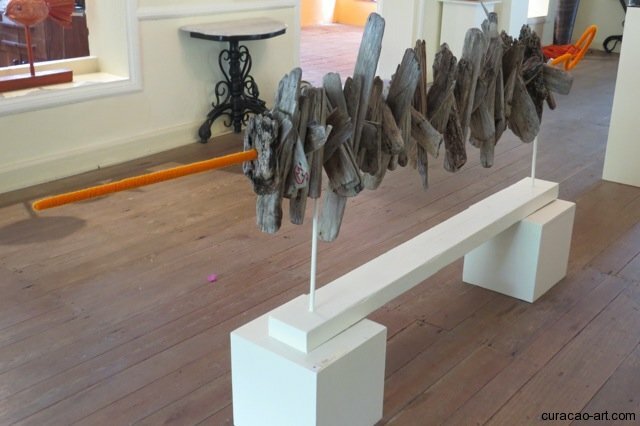 Landhuis Bloemhof invited the participants, artists and amateurs, to make an artpiece to commemorate this historic event. 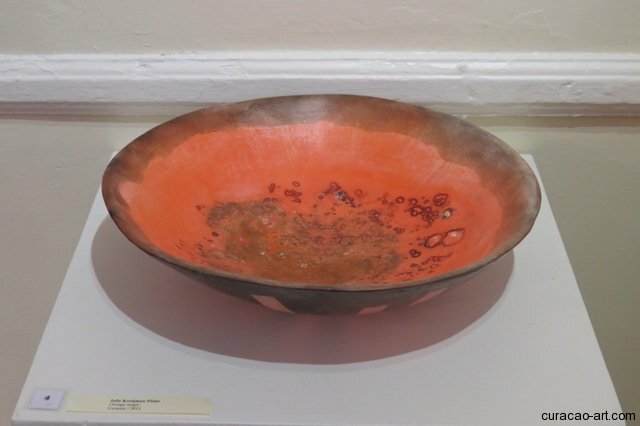 The exhibition shows a variety of artworks like installations, jewelry, statues, paintings and photographs. 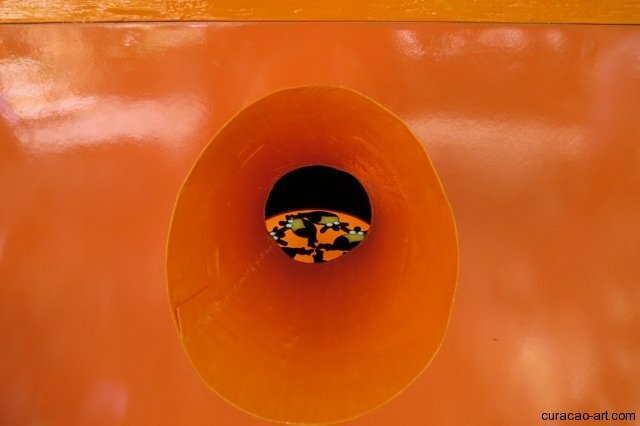 Naturally the orange color is dominant in most pieces. The photograph by Ellen Spijkstra titled ‘Lang zullen ze leven’, refers to a Dutch birthday song, which can also be sung at other celebrations for a special person or organization. By using the plural form, Long they shall live, Ellen dedicates her artpiece and wish not only to the new king, but to the royal family as well. 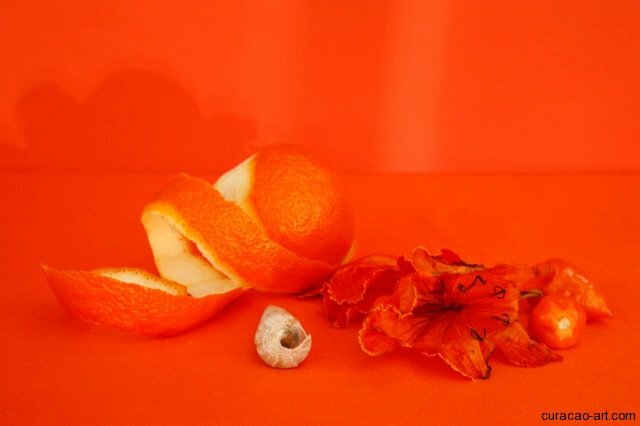 Orange is the dominant color in this photographed stillife, showing an orange peel, a shell, a flower and two peppers. 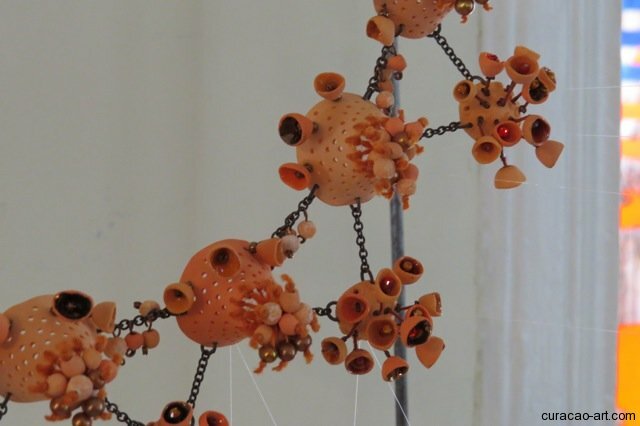 The accompanying statement by the artist explains her theme: ‘An ‘orange life’ inspired by the theme of Vanitas’. 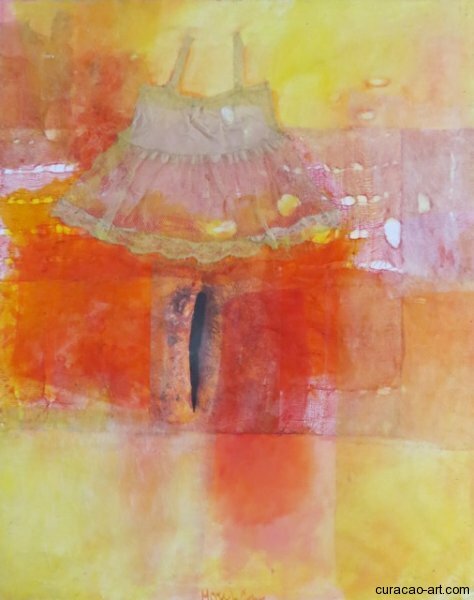 Considering the title of the exhibition, Ellen’s theme is well chosen. Vanitas (vanity) was a popular theme in the 17th century Dutch fine art. A Vanitas stillife is meant to remind us of the brevity of life and the futility of worldly posessions. 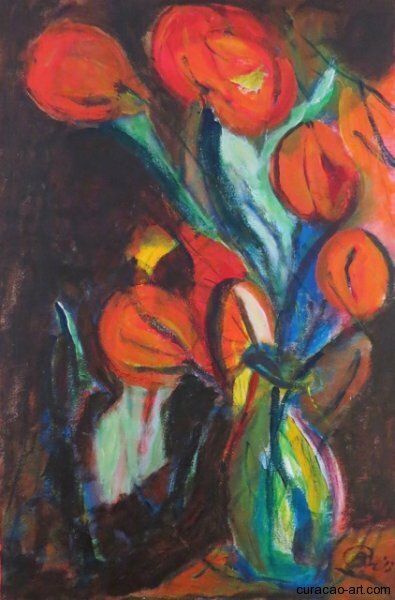 Fruit and flowers, which are at the height of their beauty and taste for only a very short time, to then rot quickly, are used in this type of stillife as reminders of man’s mortality. 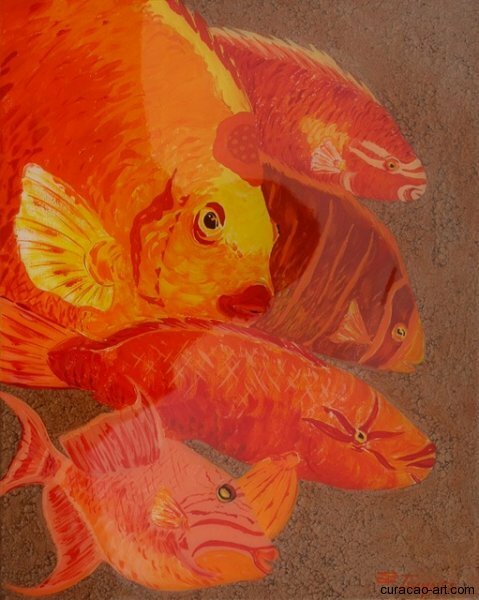 Ellen’s composition also plays a subtle game with light, the different hues of orange and the contrasting white accents. 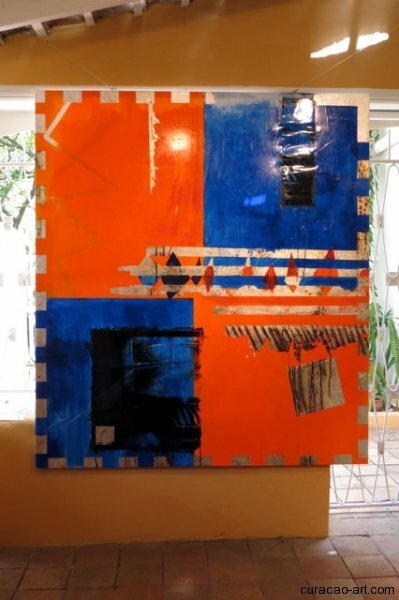 The same theme is used by the French born artist Philippe Zanolino, but more straight forward. 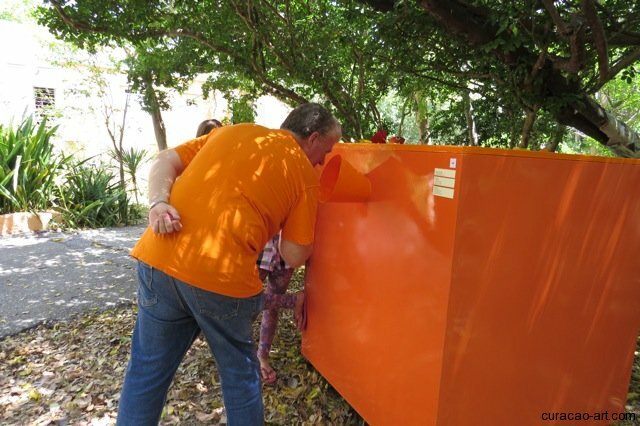 In his installation Blanc-Blue-Orange: The French Touch, a fake quillotine carries the text ‘Be a Queen King for one day’. This tool, invented during the French Revolution serves well as a reminder for our mortality and may in this setting even be meant as a protest against the monarchy. 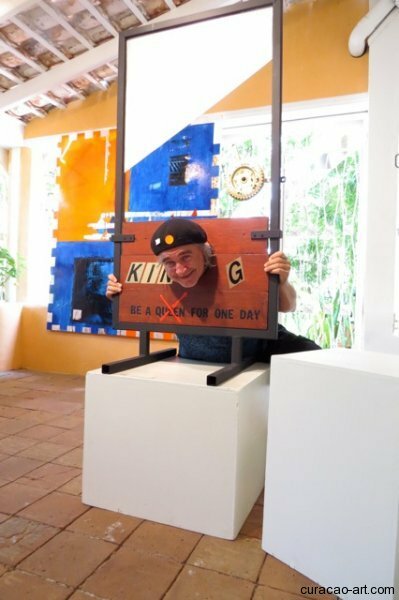 Zanolino explains his installation with the quillotine as symbolic for a king’s attitude: a king serves his people and therefor must put aside, or rather cut of, his pride and conduct himself with modesty and humility. 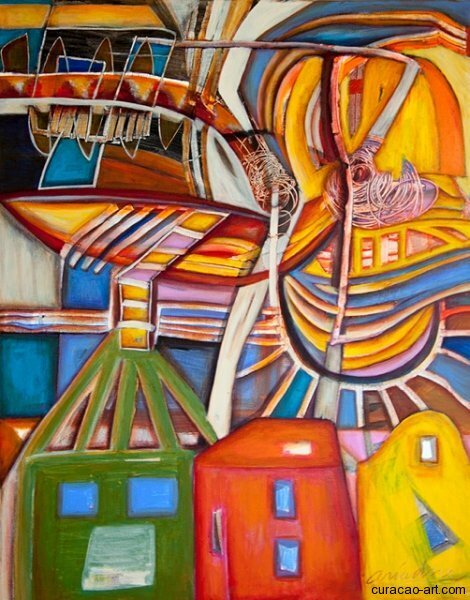 Ariadne Faries chose for the theme of sunset and lineage in her painting Sunset in WILLEMstad, which she describes as a creative impression of a sunset in the Santa Ana Bay. 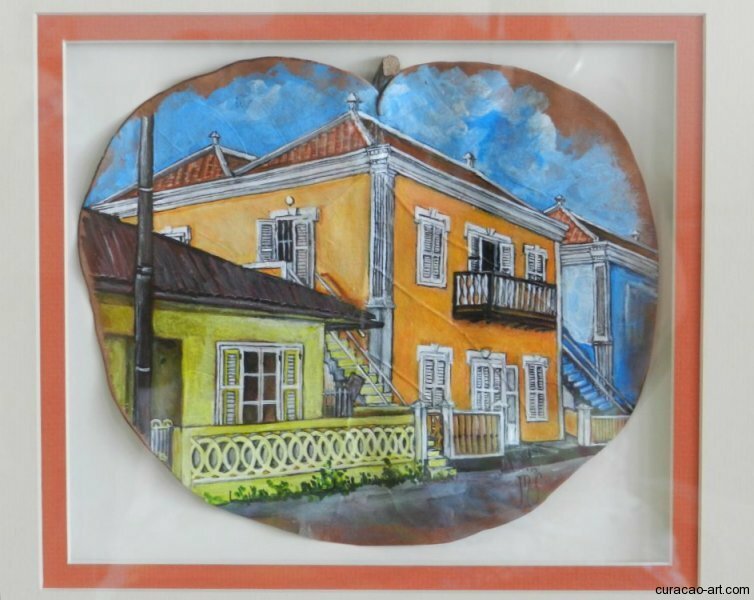 The capital of Curaçao, Willemstad, is named after one of the forefathers of the new King. With the recent inauguration of King Willem, the intention for the naming of Willemstad is again exposed. The time of sunset is ofcourse chosen for the orange colors. 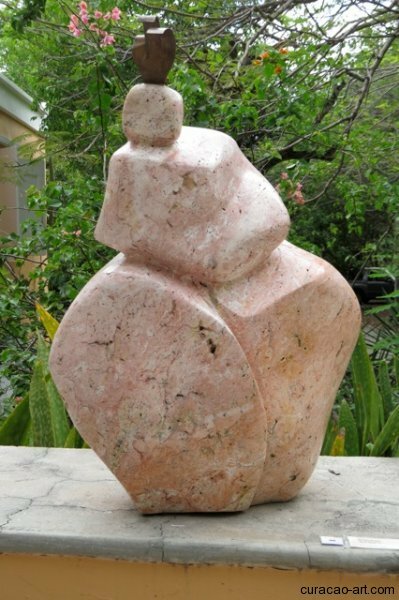 On this occasion Landhuis Bloemhof is introducing two new, starting artist: Marianne Faydherbe and Rubina Welvaart. 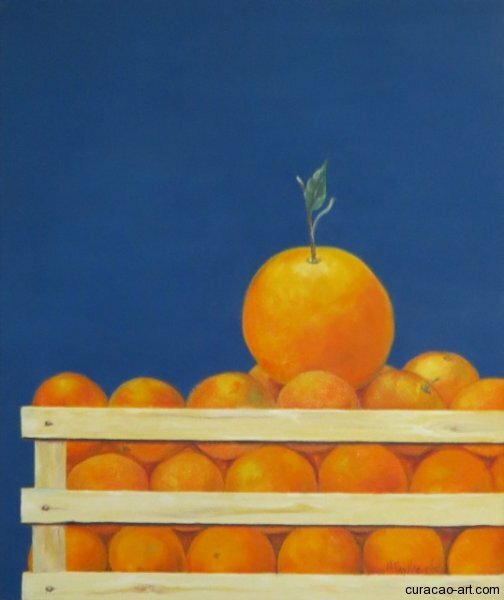 The painting by Marianne Faydherbe shows a crate of oranges in front of a royal blue background. 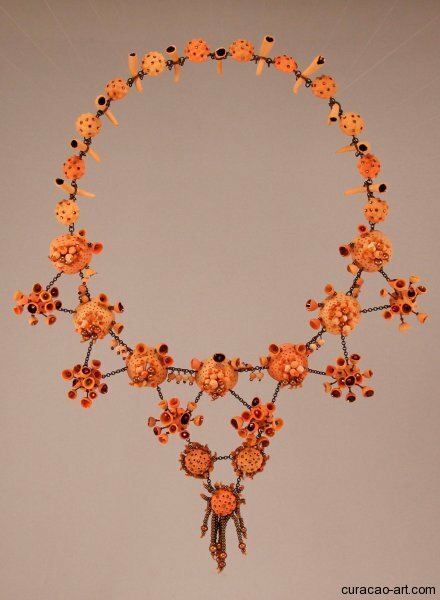 The Orange tree, Citrus Aurantium, is one of the symbols of the Dutch royal house, Van Oranje-Nassau. Its fruit is called ‘oranje appels’, orange apples. 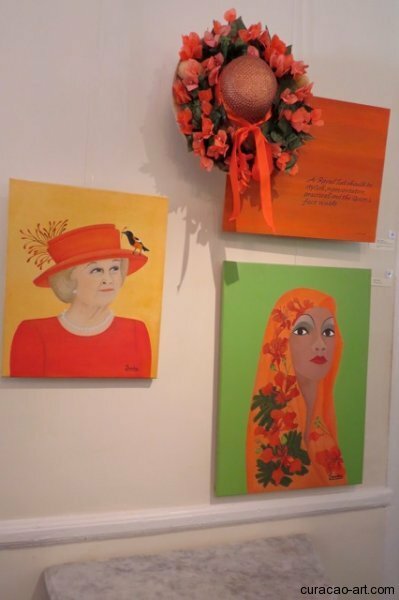 The symbolism in her painting is clear to citizens in the Dutch Kingdom. 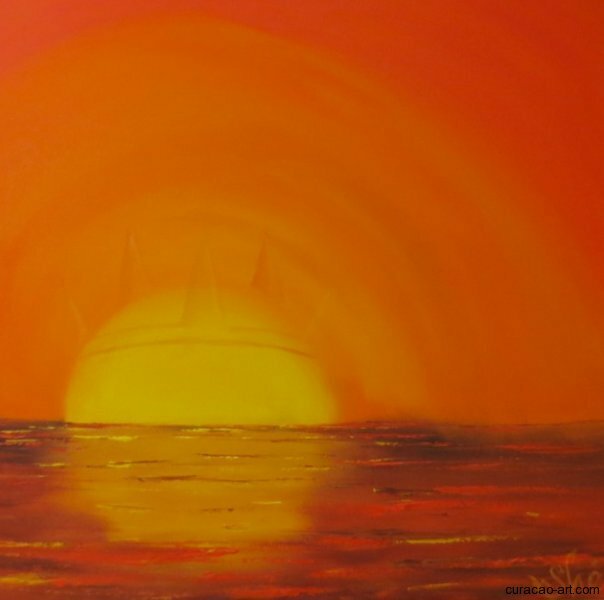 Rubina Welvaart chose for the sunset-theme. 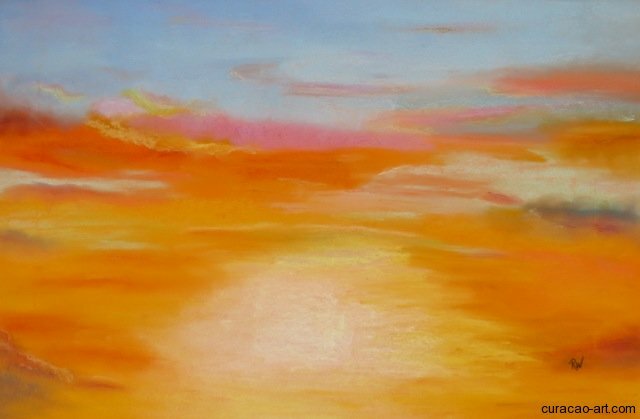 The striking orange colors of a sunset sky are executed in pastel on paper. 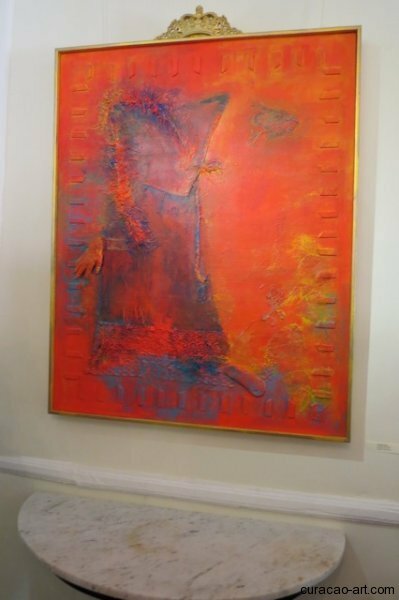 Visit this very original and varied exhibition at Landhuis Bloemhof and find out more about the artists view on the recent succession to the throne in the Kingdom of The Netherlands. 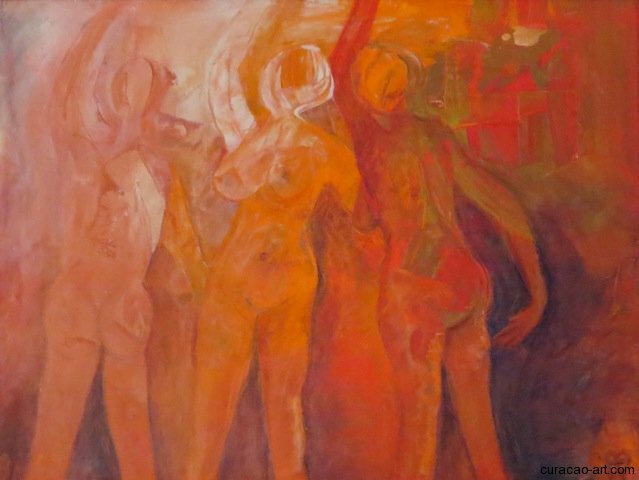 Gwen Anderson, Babs de Brabander, Hortence Brouwn, Annemieke Dicke, Ariadne Faries, Marianne Faydherbe, Martie Genger, Tanya Haynes, Saida Hernandez, Henrica Houwen, Serena Janet Israel, Julie Kooyman, Wigberto Lopez, Krista van der Meijden, Ans Mezas-Hummelink, Myrna Moreno, Shé Moreno, Margo Nelissen, Gloria Luz de Waal, Susan Rudolf, Michèle Russel-Capriles, Evelien Sipkes, Ellen Spijkstra, George Struikelblok, Brigitte Wawoe, Marjon Wegman, Rubina Welvaart, Nicoline Winkel-Querido and Philippe Zanolino.